What is the difference between a Declaration of Intention and Petition for Naturalization and a Certificate of Naturalization? Prior to 1952, a two-step process was required before an immigrant could become a U.S. citizen. Filing a Declaration of Intention was the first step. The Declaration is sometimes referred to as the "first papers." The Declaration could be filed anytime after the immigrant arrived. Generally, the law required that the immigrant reside in the U.S. 5 years before the Petition for Naturalization, or "second papers" could be filed. After the formal proceedings by the court, when the immigrant signed the oath of allegiance, a Certificate of Naturalization was given to the immigrant as proof of citizenship. The Declaration and Petition remained on file at the court. Note: After 1952, a Declaration was no longer mandatory although some immigrants filed them. What kind of information is included on the Declaration of Intention? Declarations of Intention usually include: name, address, occupation, physical description, age, birth date, birth place, date/port of arrival, port of departure from which the person left for the U.S., last foreign residence (usually city and Country), signature and date filed. What information is included in the Petition for Naturalization? 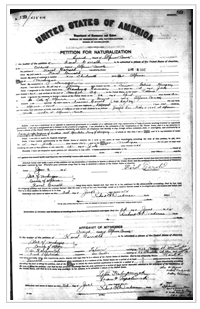 The Petitions after 1906 included all the information required in the Declaration plus information on the applicant's spouse and children. This document also included the names, addresses and occupations of two witnesses provided by the applicant. Data included sometimes differs from and is sometimes more accurate than the data on the Declaration. For more information visit the Natural Archives Naturalization Records.